The INSERTER 3000 has been developed with new and advanced features. It affixes cards quickly and easily to a card carrier which can be personalized in real time using a laser printer. 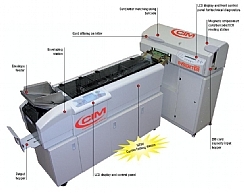 The INSERTER 3000 can operate in stand-alone or in-line configuration with other PRO SERIES equipment to offer the most complete and flexible solution: from complete personalization of the card to affixing it to a carrier, inserting and enveloping with all necessary attachments, ready for distribution. The best solution to mail your cards. • A.L.D.S. or Auto-learning Label Detector System. An advanced new sensor assembly that allows precise detection of any type of label, including transparent labels. • NEW system to recognize the label presence on the card. Thanks to this sensor, equipment reliability has increased. • A.S.T. or Anti Sliding Traction System. The label drive system has been completely redesigned allowing easy and accurate release of the label from the label roll and precise application and positioning on the card. • Label roll locking system. This innovative solution allows the label roll to be locked quickly and securely into position and provides complete unwinding of the roll. This will result in zero label wastage. • Increased label yield. New roll yield up to 3100 standard size (38×13 mm/1.50” x 0.51”) labels in every roll allows for greater autonomy.